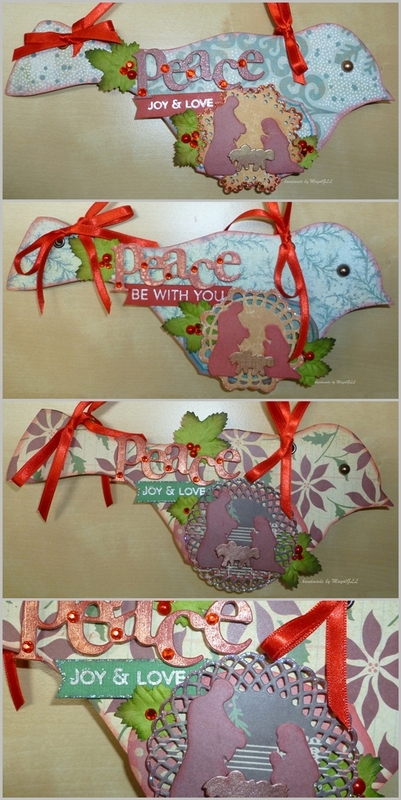 This is made up of Maya Road bird coaster board covered with Christmas patterned papers am trying to use up :) Have used PTI dies and sentiment stamps for embellishing, together with leaves and pearls and rhinestones the berries. A Prima pearl is the eye of the bird. Have misted the "peace" (PTI Wonderful Words: Holiday) die-cut with Perfect Pearls, and inked the Baby Jesus die-cut with Brilliance Gold. Supply list: Maya Road Bird Coaster Album; patterned papers - Making Memories, Basic Grey; Cardstock - Bazzill, AC; stamp - Papertrey Ink (Wonderful Words: Holiday); dies - Papertrey Ink (Wonderful Words: Holiday, Doily Details, Nativity Silhouettes, Matstack 1); leaves - Oops! Blooms; pearls & rhinestones - Kaisercraft, Queen&Co. ; ink - Ranger Tim Holtz Distress Ink, Brilliance Moonlight White, Gold, Copper; adhesives - Helmar, American Crafts; Crop-A-Dile; Daiso ribbon.